Descargar ppt "Preterite verbs ending in -car, -gar, and -zar"
1 El Pretérito de los verbos 2 I walked to the store. Yo caminé a la tienda. I bought a shirt. Yo compré una camisa. I paid with a check. Yo pagué con. 1 El Pretérito de los verbos 2 I went to the store. I bought a shirt. I paid in cash. El Pretérito: is a past tense (-ed) talks about what happened is. 1 El Pretérito de los verbos 2 Yesterday I went to the store. Ayer fui a la tienda. I bought a new shirt this morning. Compré una camisa nueva esta mañana. 1 2 SPANISH GRAMMAR Pebblebrook High School Sr.Rodriguez Fall 2009. 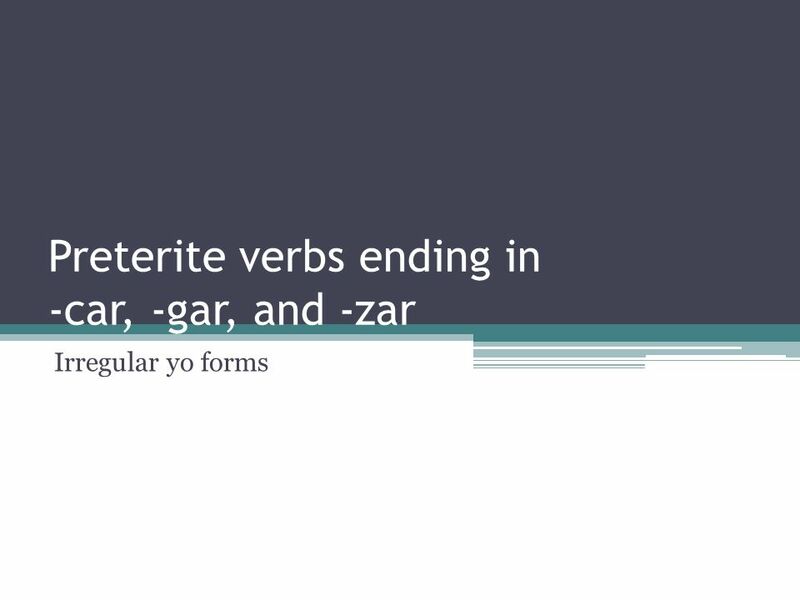 Preterite verbs ending in -car, -gar, and -zar Irregular yo forms. El Pretérito de los verbos I went to the store. I bought a shirt. I paid in cash. 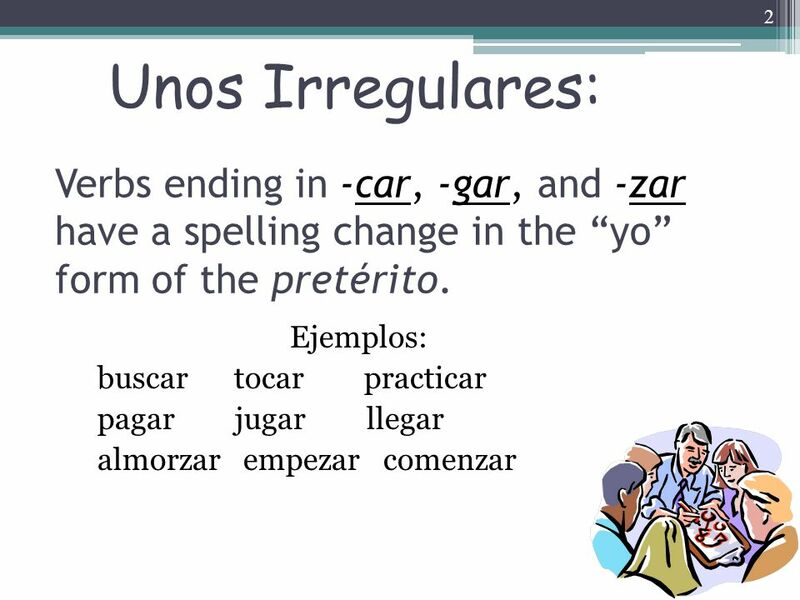 El Pretérito: is a past tense (-ed) talks about what happened is a.
Preterite of IR and SER and -gar, -car, -zar Verbs Page 19 – Chp. 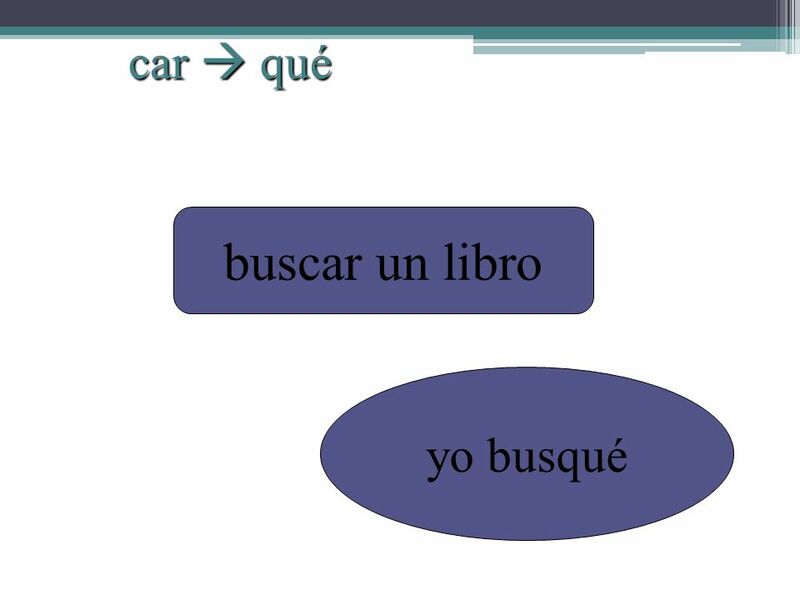 1 AVSR Realidades 3. Los verbos –car, -gar, -zar en el pretérito Don’t be sCARed! There’s something in the GARage! Watch out for the ZARs! 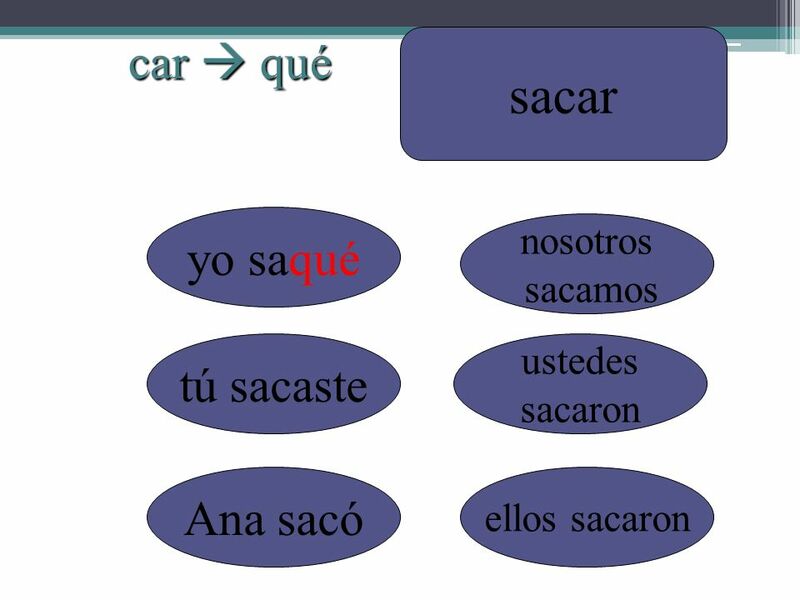 1 El Pretérito (preterite) de los verbos. 2 I went to the store. I bought a shirt. I paid in cash. 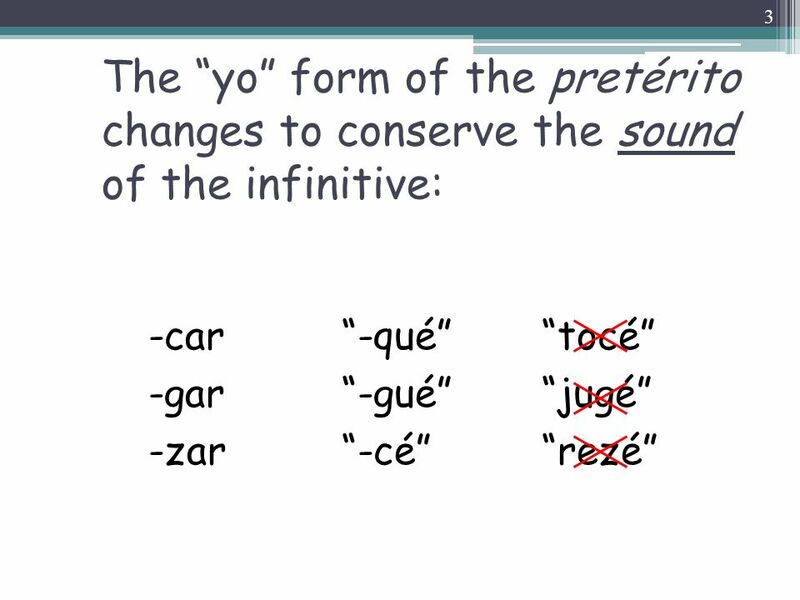 El Pretérito: is a past tense (-ed) talks about what. P RETERITE AR VERBS 1. I went to the store. I bought a shirt. I paid in cash. 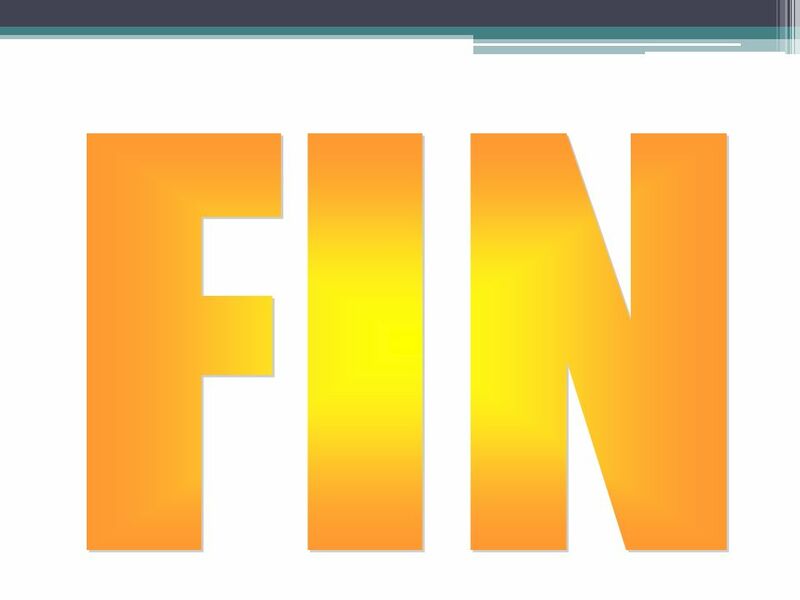 2 El Pretérito: is a past tense (-ed) talks about what happened is a completed. Preterite verbs ending in -car, -gar, and -zar Have irregular yo forms.